As consumers continue to reduce the amount of soda they drink, soft drink brands are having to adjust to meet new needs. PepsiCo has developed a new product line called Drinkfinity. As the name suggests, it provides consumers with a variety of drink combinations they can customize with a unique bottle and flavor pods. 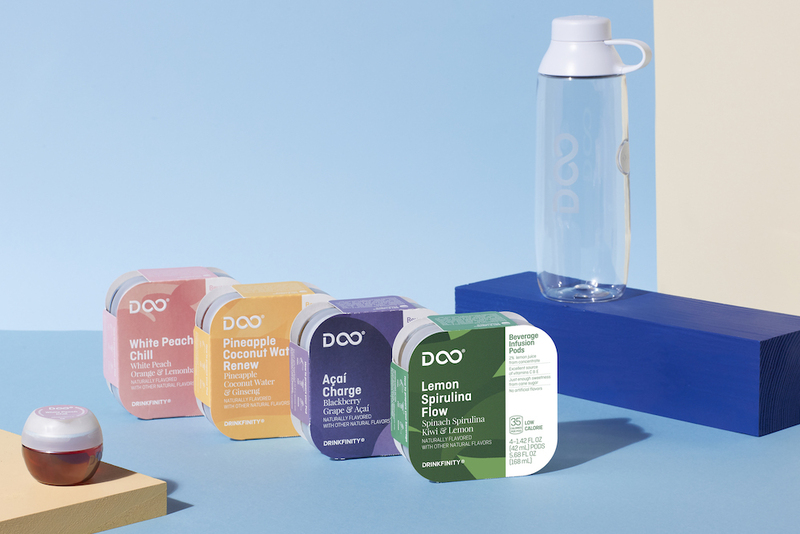 The Drinkfinity team hopes that consumers will embrace the ecosystem of the new product, which involves going online to choose flavored pods that will be shipped to their door. For the brand’s debut, it is launching 12 pod flavors. To make your drink of choice, you fill up your Drinkfinity water bottle with plain water and push the cap of the lid through a pointed plastic piece on the flavor pod. The puncture releases the liquid concentrate into the bottle, which you shake to mix and then drink. The pods contain both wet ingredients, which are mostly fruit juices, and dry ingredients, such as ginger, vitamins and lemongrass. With all natural ingredients and no artificial sweeteners, the caloric intake for each drink ranges between 30 to 80 per pod. The materials that make up the Drinkfinity bottle and pods have also been selected with sustainability in mind. The full lifecycle of a single pod produces 40% fewer carbon emissions than a typical 20-ounce drink in a plastic bottle, and the pods use 65% less plastic than a regular 20-ounce bottle.